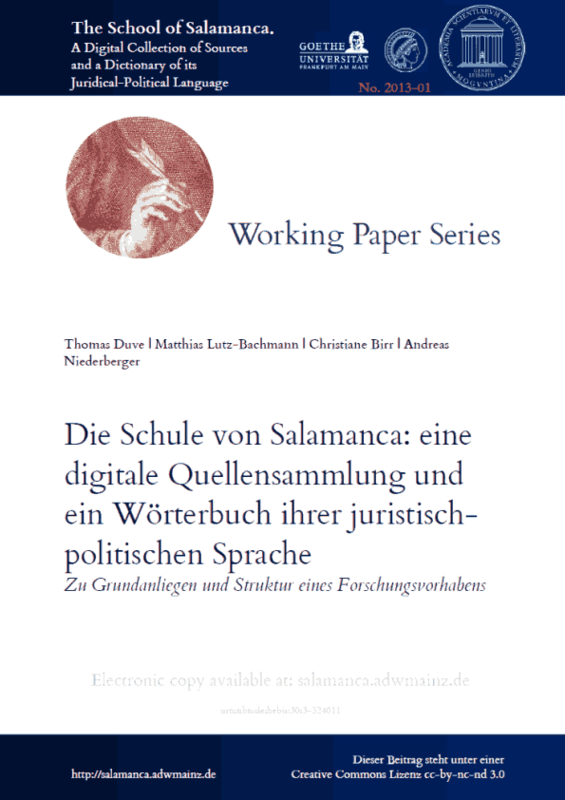 Thomas Duve & Matthias Lutz-Bachmann & Christiane Birr & Andreas Niederberger: Die Schule von Salamanca: eine digitale Quellensammlung und ein Wörterbuch ihrer juristisch-politischen Sprache. Zu Grundanliegen und Struktur eines Forschungsvorhabens, SvSal WP No. 2013-01. The article introduces a research project financed by the Academy of Sciences and Literature Mainz which has taken up work in 2013 and is conceived for a term of 18 years. It aims at producing a historical-semantic dictionary elucidating central terms of the School of Salamanca’s discourses and their significance for modern political theory and jurisprudence. The project’s fundament will be a digital corpus of important texts from the School of Salamanca which will be linked up with the dictionary’s online version. By making the source corpus accessible in searchable full text (as well as in high quality digital images), the project is creating a new research tool with exciting possibilities for further investigations. The dictionary will be a valuable source of information for the interdisciplinary research carried out in this field.